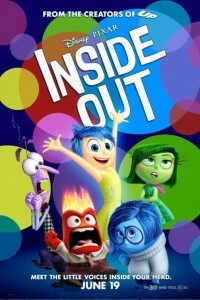 Disney and Pixar take audiences on incredible journeys into extraordinary worlds in the movie Disney Pixar’s Inside Out: from the darkest depths of the ocean to the top of the tepui mountains in South America; from the fictional metropolis of Monstropolis to a futuristic fantasy of outer space. In Pixars Inside Out, from director Pete Docter (Up, Monsters, Inc.), the audience is taken to a place that everyone knows, but no one has ever seen: the world inside the human mind. And the most important character is Joy, voiced by Amy Poehler, in a yellow dress, with short blue hair. Pixar’s Inside Out is destined for movie box office smash status. I hate to go against the grain on this one – but – I found Inside Out to be only mildly amusing and mostly tedious. The plot is thin. The emotions (Joy, Sadness, Anger, Fear, Envy) are the real show and storyline. As you would expect from Pixar, the graphics are exquisite and complex. Many scenes simply explode with color and depth. But it seemed to me that that Pixar was showing off a little and that they are still number one in this genre- rather than adding any meaning to the story. The short at the beginning of the movie, by the way, was delightful and entertaining. Be sure to stay for the credits with the emotions gone wild. I don’t know what young children thought of this movie, but for me, I am looking forward to Toy Story 4.